Saturday, April 18th, 2009, is World Heritage Day, a day to celebrate the diversity of the world’s heritage, especially its monuments and sites. To celebrate our city’s rich heritage on this important day, a number of organisations have partnered to give you a full calendar day of exciting events. The 3 hunts were organised to run between 3pm and 5pm simultaneously at Malleswaram, Gavipuram and Whitefield. There were a small group of Heritage enthusiasts who completed the hunt. Overall, it was a successful series and will likely be conducted again in the near future. If you are interested to read more about the Hunts, please go to the Malleswaram Heritage Hunt page, the Gavipuram Heritage Hunt page and the Whitefield Heritage Hunt page. Venue: Starts 3:00 pm in front of the entrance (Gate 1) to St. Peter’s Seminary, 8th Main, Malleswaram, Bangalore. 1. BCP volunteers will be wearing WHITE colour T shirts, BLUE colour jeans & ORANGE dupattas/anga-vastra. Venue: Starts 3:00 pm in front of the entrance to Bull Temple, Bull Temple Road, Basavanagudi, Bangalore. 2. You will be given a map marking the limit of the area of the hunt with Six heritage hubs marked on the map. Name the hubs and solve the puzzle slips that you will be given along with the map. Present all solved slips to the volunteers at Bull Temple by 5:00 pm for your surprise! Venue: Starts 3:00 pm in front of the entrance to Whitefield Club, off Whitefield Main Road, Bangalore. 2. You will be given a map marking the limit of the hunt area and a sheet with numbered puzzle slips. Walk around the area and search for Heritage Hunt stickers. When you spot one, note the number on that sticker and read the corresponding numbered clue, solve the puzzle and move on. Present all solved slips to the volunteers back at the Club by 5:00 pm for your surprise! Just walk in 3pm onwards and get started! but remember first come first served - call 99721 14110 for any queries. All participants might just get a surprise, while a special gift awaits the team, which solve all the clues first to crack the hunt.please remember to carry water, some snacks and a cap / umberella. Time: 8:30 – 11:00 am; Venue: Tipu Palace, Bangalore Fort and its vicinity. Bangalore’s heritage by author Vikram Sampath, release of a set of postcards on Bangalore’s heritage, and light music by Vijay Havanur. 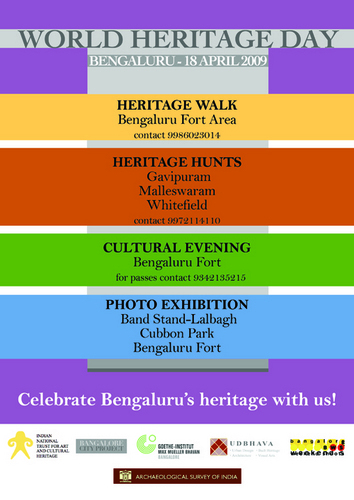 These events are organised and supported by the Archaeological Survey of India, Bangalore Circle; Department of Kannada and Culture, Govt of Karnataka; Bruhat Bengaluru Mahanagar Palike; Bangalore Weekend Shoots; Bangalore City Project; Max Mueller Bhavan/Goethe Institut; UDBHAVA Forum; ABIDe; and the Bangalore Chapter of INTACH.